Have you ever visited a legendary BBQ spot or watched a respected pitmaster work at his craft? If so, you’ve probably noticed that the pros generally use offset smokers. While “set and forget” electric and pellet smokers can make some amazing food, something just feels right about tending a fire. In this article we’ll help you choose the best offset smoker so you can take the next step towards mastering the art of BBQ. What Should You Look for in an Offset Smoker? 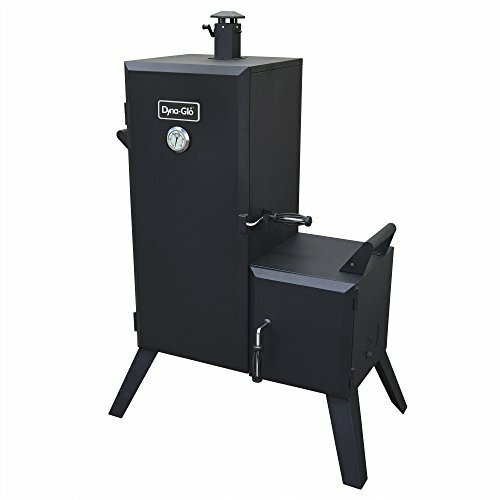 The Dyna-Glo Charcoal Offset Smoker is our number one pick, with superior heat and smoke distribution, heavy-duty steel vertical design, and excellent fuel efficiency. For customizable smoke and heat flow, Oklahoma Joe’s Longhorn Reverse Flow Smoker utilizes four baffles for accurate maintenance of temperature and air flow. For a professional-style grill with super easy cleanup, the Char-Griller 1224 Smokin Pro 830 offers an ‘easy dump’ ash pan and includes a warming rack for convenience. Extremely versatile and heavy-duty, the Smoke Hollow 4-in-1 Charcoal Smoker and Grill allows for several different kinds of cooking at once. The Dyna-Glo Signature Series Heavy-Duty Vertical Offset Smoker is the tallest on our list, providing several racks for the ambitious pitmaster. To jump to our in-depth write-ups for each smoker, click here. Offset smokers are one of the most classic smoker styles and tend to be used at barbecue restaurants. They most often feature two compartments: one larger section, usually with shelving, for holding the foods to be smoked – and one smaller that contains the fire (charcoal and wood). They are referred to as “offset” since the intense heat is positioned to the side, allowing your meat to cook at a relatively low temperature. Additionally, by having two separate compartments, each with their own dedicated function, clean-up is made easier. Large compartment for foods means many different items and bigger quantities can be smoked at the same time. Simple design and a lack of complex mechanical components means, with a little maintenance, smokers often last for many, many years. Flavor profiles are easily customizable by using combinations of wood chips and charcoal. Adding fuel is simple, and since it is burned in a separate compartment, there is no need to open the cooking chamber. Most models of offset smokers can also be used as standard grills, offering versatility for the home user. Building and maintaining a fire. Controlling the temperature by modifying airflow. Step 1, building a quality fire, starts off by not skimping on charcoal. If you use a good amount and replenish wood as necessary, you’ll be surprised how long your charcoal will last. This is mainly due to low exposure to oxygen during the cooking process. The second part of the equation, controlling airflow, will come through experience with your particular smoker. Every model is a little bit different. Remember to be patient and not overreact to small changes in temperature. Overall quality of materials is the most important thing to consider when choosing your smoker. You will want a thicker, heavier metal gauge. This helps with heat retention and prevents warping through temperature and weather extremes. Weight can be very telling when assessing an offset smoker – heavier is generally better. Quality seals and dampers are also important. You don’t want any of that precious heat and smoke escaping without your permission. The dampers should seal tightly while still being fairly easy to slide open and shut. Smokers come in a variety of shapes and sizes, so it’s obviously important to choose a unit that fits nicely in your yard. Taking measurements of the area you intend to put your smoker in helps with gauging the size. Also consider how often you’ll need to move your smoker. Some offset smokers can weigh in excess of 200 pounds, which may make moving for storage an issue. If you don’t have a ton of space but want a large capacity, then you could probably benefit from the relatively small footprint of a vertical model. And don’t forget: while larger smokers have obvious advantages, they take longer to heat up and require more fuel. Our number one pick for your backyard smoker is from Dyna-Glo, a well-known and established brand. 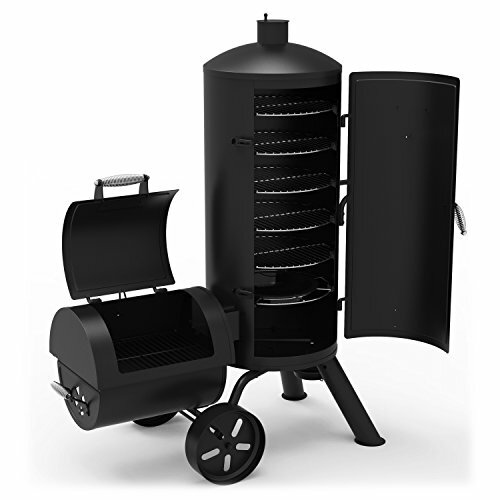 Built vertically and with heavy-duty steel, this smoker is designed to provide even heat distribution for the highest quality smoking. The offset fuel compartment allows heat to rise, creating a more efficient method of smoking. With 1,176 square inches of cooking space (!) spread over six adjustable grates, this offset smoker is able to smoke up to 100 pounds of food at a time. For increased fuel efficiency, the offset charcoal chamber is porcelain-enameled and designed to keep briquettes and logs stacked tightly. The sizable ash pan is able to hold hours’ worth of waste, meaning less maintenance during cooking. Also, it easily slides free from the charcoal chamber, making clean-up quick and easy. Complete with an adjustable flue on the smokestack and a built-in thermometer, this Dyna-Glo model allows for precise and simple temperature monitoring during use. The thermometer itself is crafted from high-quality stainless steel. It features a ‘Smoke Zone’ gauge, designed to help you achieve the most intense flavor and the best end result. More traditional in design, the barrel-shaped Longhorn smoker from Oklahoma Joe’s is constructed from heavy-duty steel. As a result, it weighs in at a hefty 196 pounds. Despite the weight, two sturdy wheels allow for easy movement from storage to yard when needed. 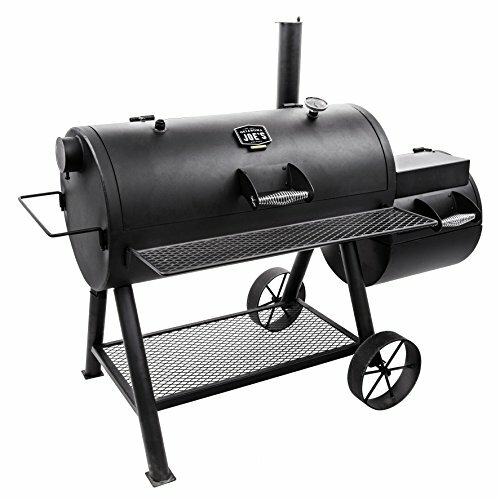 With the addition of four carefully designed baffles which lock under the cooking grate and optional smokestack locations, this smoker can be used as both a traditional offset smoker or as a reverse flow smoker. The baffles channel the smoke under and then over the food, creating a more even smoke and heat distribution. The large firebox basket holds a plentiful amount of your chosen fuel, making maintaining a steady smoking temperature much easier. Stoking and adding fuel without having to open the main cooking compartment keeps the smoke securely contained, preventing loss of flavor. This firebox is easy to clean, with a convenient door located on the side for removing leftover ash and fuel. The Longhorn has an impressive 1,060 square inches of cooking space. This is divided between the main grate at 751 inches and the firebox grate itself at 309 inches. This additional firebox space is ideal for preparing side dishes to accompany your meal. With the inclusion of a metal shelf below the main smoker, you can keep your cooking tools and extra fuel within reach. This smoker is fitted with an air temperature gauge on the right side of the cooking chamber, with the option to add a second gauge if desired. The Smokin Pro from Char-Griller is a traditional barrel-shaped offset smoker that also functions as a high-heat grill. Like all of the smokers on this list, it provides an ample amount space for food. Its main cooking area is 580 squares inches, with an additional 250 square inch side fire box. Crafted from a combination of heavy-gauge, powder-coated steel and non-stick cast iron, the Smokin’ Pro is a durable grill designed to last and withstand the elements. The cast iron grill grates provide an even cooking surface, and the adjustable fire grate allows you to control heat with ease. The additional warming grate is ideal for keeping cooked foods at the right temperature when you continue grilling. Beware that there are a couple common complaints about this smoker. The first is that the paint tends to peel off fairly easily, particularly with higher temperatures. If you’re concerned about the appearance of your smoker, this may not be the right choice for you. The second complaint is that smoke and heat escape from gaps. You can use a product like this ‘Smoker Sealer’ from LavaLock to remedy this issue. For the barbecue-lover who wants it all, the 4-in-1 smoker and grill from Smoke Hollow delivers. Gas, charcoal, infrared, and smoking are all available cooking methods with this model. Weighing in at 218 pounds, this grill is a sizable addition to any backyard. However, it does include wheels for ease of movement. Since this model combines four different cooking methods, the offset smoker portion is not as large as others on this list. However, you’ll still have enough space to smoke a brisket or a couple racks of ribs. Additionally, it features a sliding front damper to control air flow and temperature. Waste ash is easy to remove, since it’s contained within a removable sliding drawer. 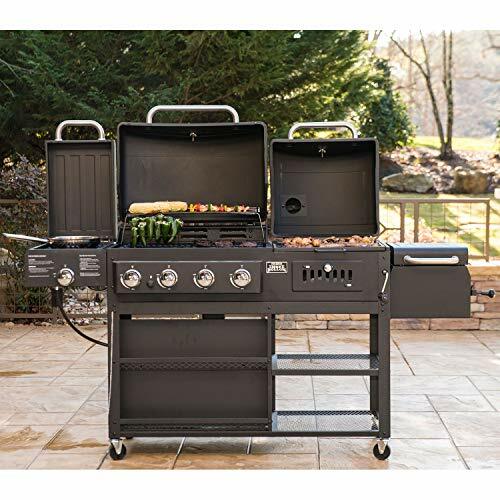 The propane grill portion includes four stainless steel burners, and push-button ignition makes lighting them a breeze. If you need even higher temps, the infrared burner is there to give your meats a great sear. All of the grill areas come with porcelain-coated cast iron grates. This is a great model if you’re looking for an all-in-one option; the only potential drawback is the relative small size of the smoker. Another model from Dyna-Glo, this combination grill-smoker gives you the best of both worlds when it comes to your backyard barbecue. This smoker offers the largest amount of cooking space on our list. A massive 1,382 square inches are spread over five chrome-plated vertical grates in addition to one in the firebox. While this model weighs just over 124 pounds, it has large wheels for mobility. The vertical design with offset firebox allows for more even heat and smoke distribution, preventing hot and cold spots. The firebox includes a porcelain-enameled steel grate, which provides an exceptional sear. This smoker also includes a removable ash pan for quick cleanup. A professional-grade stainless steel temperature gauge accurately monitors heat, with two zones clearly marked for your convenience – ‘Smoke Zone’ and ‘Grill Zone.’ Both the offset firebox and the main cooking compartment feature a cool-touch, heat-resistant handle for easier and safer access to food and fuel while the smoker is in use. This model also comes with a pre-installed, chrome-plated hook rack for sausages. Each one of these five offset smokers is a great addition to your backyard. While the Dyna-Glo Charcoal Smoker gets our best rating for overall quality and fuel efficiency, the choice was tough. 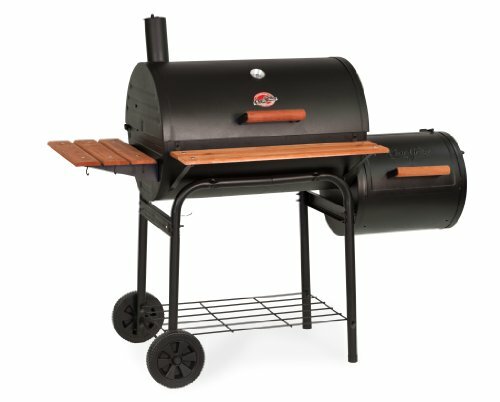 From the truly versatile Smoke Hollow 4-in-1 to the cleverly designed Longhorn from Oklahoma Joe’s, the impressive grill space of the Dyna-Glo Signature Series and the professional quality of the Smokin Pro from Char-Griller – each offers something unique to give you the best possible barbecue experience. Consider which one would best suit your needs and choose the best offset smoker for you!